I can say “Who needs a personal trainer?” somewhat tongue-in-cheek because I, in fact, am a certified personal trainer. And although I know personal trainers are AWESOME for helping you break through barriers and reaching your full potential, they can be expensive. And if you’re someone who doesn’t have the extra money to spend, yet don’t feel comfortable enough to act as your own trainer, you can kind of be in a fitness predicament: How do you know if you’re working hard enough and if you’re really doing the right kinds of exercise? Enter My Trainer Fitness. 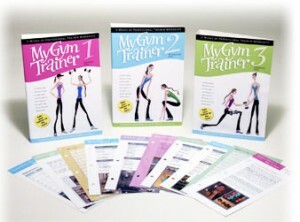 This little set of workout books gives you four weeks of workouts in a handy binder that you can take to the gym. The pages are laminated so that you can “glow” all over them, and they are filled with tips, tricks, photos of the exercises and clear directions of exactly what to do for cardio and strength. Available in three fitness levels—beginner, intermediate, and advanced—it really is like having your own trainer right there for a full month. The company sent me its advanced My Gym Trainer book, and I was super impressed. Each week had a new theme of sorts (mastering the Smith Machine, compound movements, intervals, etc. ), and the workouts weren’t playing. Definitely advanced, the hour-plus workouts included a nice mix of strength and cardio six days a week. From running on the treadie at an 8-mph pace to squat jumps and hanging knee raises, it’s not for the faint of fitness heart (or those without six-plus hours a week to dedicate to fitness). I do wish the books included a proper and planned out warm-up and cool down, and you pretty much have to be at a gym with a wide range of equipment for every workout, but those are the only complaints I have. Sounds neat – thanks for pointing these out! LOVE this idea! Where can we find these??!!! They sound wonderful especially since I workout at home. Thanks, Jenn! SO GLAD you like the workouts! I love ’em and alternate between My Gym Trainer 2 & My Gym Trainer 3, because I’ve found that the circuits in MGT2 adjust to your level by virtue of the weight you choose and the cardio is still a challenge, or, you can rev it up a bit. But, alternating between the two books keeps it more interesting into my 2nd year with them. But YES! If you can afford a personal trainer for part of the time? Go for it! Can’t replace a good one with anything. If you can’t? My Trainer Fitness workouts to go! Oh! P.S. Good point about warm-up and stretching. We left these off for folks to do on their own because we were space-challenged, but you’re right, we should add it in next time ’round. Thanks again! Adjustable dumbbells great tool for exercise. This is the one of helpful article that you alway share, I never comment but this time want to say thank you because I got a lot I idea from this site.